An exhibition of art works inspired by the life of Robert Burns is taking place in Glasgow. Leading contemporary artists including Tracy Emin and Peter Howson were each invited to create a piece that reflected Scotland's national bard. 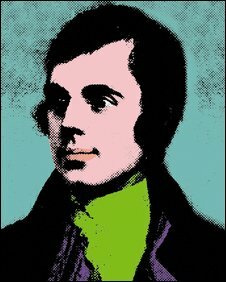 These contemporary works, which are largely new and unseen, will be displayed at the Mitchell Library alongside other Burns items. Tracy Emin has provided a work inspired by one of Burns's poems, as has Douglas Gordon. Several artists have submitted new portraits of him including Sacha Newley and David Begbie, who has created a wire mesh portrait. Holly Johnson and Graham Fagen were both inspired by 'My love is like a red, red rose'. Sheilagh Tennant, curator of the Inspired exhibition, said: "The Inspired artists have been remarkably successful in conveying the contemporary relevance of Burns's work. "While I have been aware of both the high standard of the work and the huge variety of interpretations for some time, it was not until I saw it all together in the exhibition space that I fully appreciated the power of the work." Tourism Minister Jim Mather said: "Inspired promises to be a highlight of the Homecoming celebrations. "It is an excellent example of how the life and work of Robert Burns continues to influence and inspire contemporary artists 250 years after his birth." The exhibition runs from 4 April to 20 September in the Main Hall at the Mitchell Library.